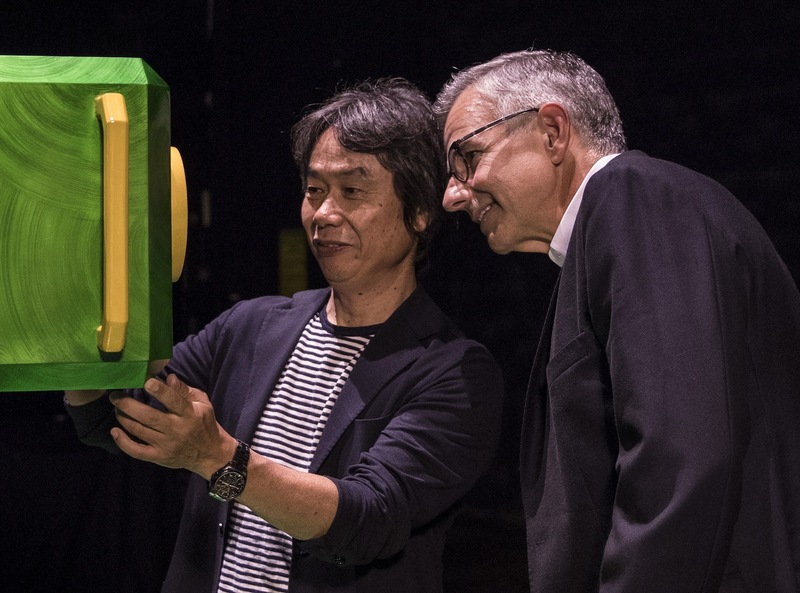 Shigeru Miyamoto, Senior Managing Director and Creative Fellow of Nintendo, discusses attraction features with Mark Woodbury, President of Universal Creative. © 2016 Universal Studios. All Rights Reserved. Kyoto, Japan and ORLANDO, Florida, Hollywood, Calif. – Imagine the fun of stepping into a larger-than-life Nintendo adventure. Gigantic Piranha Plants spring to life. Question blocks, power-ups and more surround you. And Mario and all his friends are there to pull you into a brand-new world. The worldwide pioneer in the creation of interactive entertainment, Nintendo Co., Ltd., of Kyoto, Japan, manufactures and markets hardware and software for its Wii U™and Wii™home consoles, and Nintendo 3DS™and Nintendo DS™families of portable systems. Since 1983, when it launched the Nintendo Entertainment System™, Nintendo has sold more than 4.4 billion video games and more than 696 million hardware units globally, including the current-generation Wii U, Nintendo 3DS and Nintendo 3DS XL, as well as the Game Boy™, Game Boy Advance, Nintendo DS, Nintendo DSi™and Nintendo DSi XL™, Super NES™, Nintendo 64™, Nintendo GameCube™and Wii systems. It has also created industry icons that have become well-known, household names such as Mario™, Donkey Kong™, Metroid™, Zelda™and Pokémon™.